Looking for a simple and fast dinner idea? These chicken enchiladas are easy to put together and taste great. If you use a roasted chicken, it goes together even faster. I like to make my own shredded chicken. I takes a little more time, but I love the flavor. I will share how I do this in another post. I did not put the onions in this batch, since my stomach doesn't like them. You can change up the cheeses to suit what you like, these make a great combo. I divided the chicken mixture among 6 flour tortillas, that is all I had on hand. I placed them in the dish with the seam side down. Next I made the roux. I added the sour cream and green chilies to the roux and poured it over the tortillas. Added the remaining cheese and baked it at 400 degrees for 20 minutes. Yummy! 1. In frypan, cook onion in oil over medium-high heat until golden. Add shredded chicken and heat through. 2. Divide cooked chicken evenly between 8 tortillas; add 1 1/2 tablespoons cheese to each tortilla. 3. Roll enchiladas and place seam-side down in 9x13" baking dish that has been lightly sprayed with non-stick cooking spray. 4. Melt butter in a medium saucepan; stir in flour to make a roux; stir and cook until bubbly; gradually whisk in chicken broth then bring to boiling, stirring frequently. 5. Remove from heat; stir in sour cream and green chiles; pour sauce evenly over enchiladas. 6. Top with remaining 3/4 cup cheese (baking dish may be double-wrapped and frozen at this point) and bake at 400F for 20 minutes until cheese is melted and sauce near edges of baking dish is bubbly. I hope you enjoy this as much as we did. As you may already know I am a retired college professor and between my husband and I we have 6 college graduates and several grandchildren who are nearing college age. As a parent and professor I was constantly reminded of the huge cost that students incur when buying their text books. If any of you are parents or even students, I’m sure you can relate. Well, for a nominal advertising fee I have been asked to endorse a program being offered by CampusBookRentals and I have agreed. This post was written by me and all opinions are 100% mine. I want to focus on two items of note. The first and very important is that they partner with Operation Smile. I wanted to do something different for my Valentine decoration this year, but what? I was cleaning out some wood in the barn and created a pile of wood trim pieces that I used for testing paint colors. I hated to throw them away, but they were small pieces and not really "Valentine" colors. My mind started to work and I thought, why not a Valentine plaque. So here is what I created. Now let me tell you how I did this. Broken washing machine, means new floor! Nothing like seeing water floating all over your laundry room floor to make your day. Well that is what happened last Monday. Our laundry room is between the kitchen and the garage. Water ran into the garage but not into the kitchen. I had projects out there that had to come up off the floor and be dried off. What a mess! The new washing machine couldn't be delivered until Wednesday night. We had put down Brazilian Cherry re-engineered flooring in the great room and into the kitchen. We stopped where the kitchen meets the laundry. It has been that way for 2 years. Here's the new floor. The dogs seem to like it. This is their area since I feed them here and their water bowl is here. I am so excited to be co-hosting with Heather over at My Sweet Mission. Her blog was created from two of her passions in life; baking and missions. Her love for baking goes way back to when she was a young girl. Both heather and her husband are involved with local and global missions throughout the year. You can read more about her here. 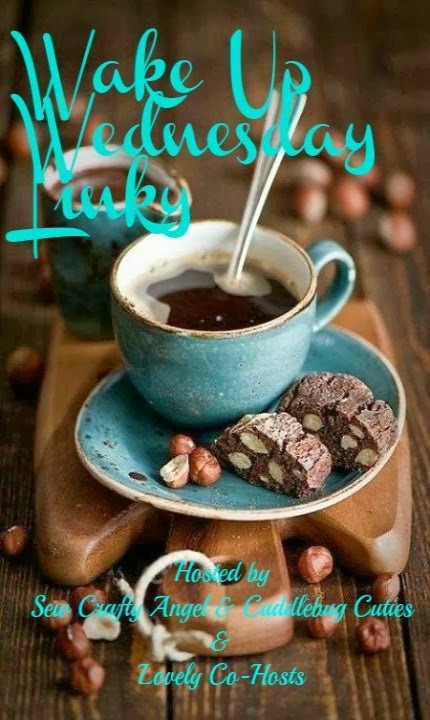 Thanks for linking up your best, family friendly posts to the Sweet Wednesday Link Party #18! what you're going to link up today! Don't linkup parties, shops or giveaways. I have a strong love of boxes. It is hard for me to pass up any type of box at a flea market or garage sale. You can do so many things with them. So when I saw these boxes at a garage sale a few years ago, I had to get them. Of course the price - 50 cents each, was also a contributing factor. I know that many of you are dealing with extremely cold temperatures. We even dropped down to the low 40's last night. I know, get serious. It was cold for Florida. Before the cold hit last night, I was outside with the dogs and saw this bit of red calling to me. As I got closer, I realized that these plants were blooming. It was so pretty that I thought I would send a little brightness to everyone who is trying to keep warm. Do you have any turkey leftovers from the holidays? Well, I did from before Christmas. I made a turkey before we left for Vermont and froze the leftovers. I love to make pot pies with leftovers. I have used beef, chicken, turkey and even ham in this recipe. One of my presents came right before Christmas - these wonderful Elliott pecans. My brother-in-law manages a pecan farm in Georgia and this year they had a great crop of Elliott pecans.